…and probably due to Sen. Antonio Trillanes IV et al. and their attempts to have the Supreme Court prevent the implementation of the K-12 Basic Education Program, said K-12 program trended on Twitter, albeit briefly, last Wednesday night. The online discussion was lively; even if understandably tending to lean against the program’s implementation. A 12-year program is found to be the adequate period for learning under basic education. It is also a standard for recognition of students and/or professionals abroad (i.e., the Bologna Process for the European Union and the Washington Accord for the United States). Other countries like Singapore have 11 years of compulsory education, but have 12 to 14 years of pre-university education, depending on the track. The Philippines is the last country in Asia and one of only three countries worldwide (the other two being Angola and Djibouti) with a 10-year pre-university cycle. Obviously, these are valid reasons; and yes, the program’s implementation may indeed bring some desired benefits. However, that the K-12 program will be the answer to turning around the dire state of Philippine education as shown by performance statistics accumulated in recent years, this I cannot say that I am convinced about. In other words, the Department of Education believed when it proposed the program that adding two more years would decongest the curriculum and allow students more time to master concepts and, therefore, be better prepared for employment or university upon completion of the then-proposed K-12 curriculum. Fair enough, I can understand this line of thinking. I was in the education industry for three decades and yes, I did feel that the curriculum tried to push too much down students’ throats. In the same breath, I can also say that the logic was also a tad too straightforward for its own good. What the line of thinking was essentially saying was that if you added two more years to the current ten, you would improve the quality of education. To be fair to the Department of Education, for all we know the K-12 can be just what the doctor ordered. However, even the most foolhardy among those who like to place a wager every now and again will want to look at the odds. If one is in management, while there is an element of risk to every undertaking, one’s job is premised on the assumption that one is capable of ensuring that an undertaking has more chances of success than failure. What are the chances, then, that the K-12 program will indeed be the long sought after shot in the arm for basic education in this country? If, indeed, there is merit to the results of this study, does it not render the K-12 something of a capricious gamble? Moreover, it will also be something of an expensive gamble, expensive being from the viewpoint of government – and, therefore, the taxpayer – as well as the household that has to scrounge for every student’s daily expenses while going through an added two years of school. Now to the more relevant question – can we even afford it? If one drives around agrarian communities in this country, one sees that there is a ubiquity of these unfinished brick houses the owners of which are obviously waiting for future incomes to have their houses completed. For the owners of these houses, household sizes being constant, will it not make better sense to use incomes when they do arrive for the completion of their houses before even contemplating the building of extensions? Using this as a metaphor, will it therefore not make more sense to use precious resources on addressing the pressing concerns of the K-10 first before adding two more years; if at all there will still be a need to do so? Otherwise, all the Department of Education will succeed in doing will be to add two more years of the very same problems that it seemingly has perpetually been trying to address for the K-10 alone. That there are problems we are all too familiar about whatever the official announcements to the contrary are. We hear about them often enough on the evening news: teacher shortages, makeshift classrooms, shortages of instructional materials, over-enrolment, to name just a few of a seemingly interminable list. Will it not make more sense to undertake a thorough, non-politicised, honest and professional review of the existing K-10, set stringent standards of excellence to be met and then devote resources into meeting these standards? Will it also not make better sense to contemplate adding two more years only after these same standards have been reasonably if not thoroughly met? For all we know, the additional two years may not even be necessary. If one insists that they still are for the recognition of students and professionals abroad, then one also has to answer the question what percentage of the country’s 21.6 M (2013) basic education students will this even be relevant to? Not that there will ever be a quick fix to the K-10 alone; and the problems of the education industry run far deeper than a congested curriculum. Somebody once argued with me that if the Department of Education tried to fix the K-10 first before implementing the K-12, then it will never be able to do so because of the sheer volume of things needing to be fixed with the K-10 alone. When I first went to university more than three decades ago, I was a product of a K-10 program. Many of my classmates were graduates of K-11 programs in supposedly exclusive Metro Manila schools. It did not take me long to realise that the only edge that they had over me was age and maturity; which did not necessarily translate into any sort of edge inside the classroom. 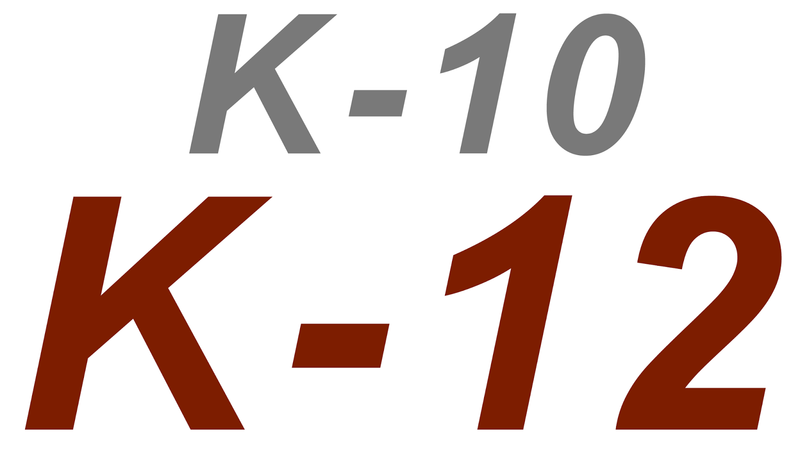 So will the K-12 offer any real improvement over the existing K-10? I rather suspect that I already know the answer to this.